We’ve done our best this week in reminding readers that our interest in AYTU was not a drill. Beginning from our initial alert in last Wednesday’s premarket report, the stock was exhibiting all the signs of a recovery play. Yesterday we reiterated our interest for the second time this week, mentioning how the stock had already come a considerable distance from our observed low of .4118, and that it had picked up momentum on Monday, and that more gains could be in store. 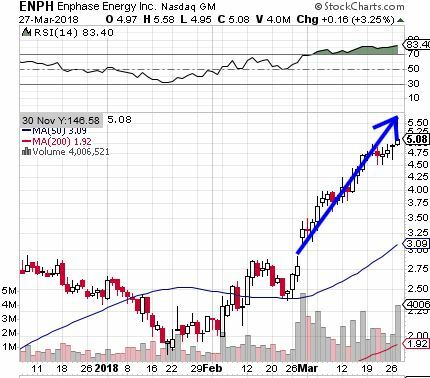 Recently, we have had quite a few plays we’ve signaled within the past couple of months, exhibit really convincing, sustained uptrends, and ENPH is another one to put in that category. While our most recent mention of the stock came on March 19th, in the midst of the current run as a reminder, our initial call came on February 28th. On that day, the stock saw a low of 3.07 and hasn’t looked back since. Yesterday, ENPH surged to a new high of 5.58, marking a respectable one month run of 82% during which time volume has also been greatly increased. It was just yesterday morning that we were remarking on the continuously bullish tendencies of HMNY over the past few weeks since we began tracking it on September 20th. Yesterday we were talking about some options calls we made on Friday for MNKD, the 10/20 $5.50 & $6.00 Calls, which have made some good moves, but we neglected to mention our success on the stock side itself. Delta Air Lines. Inc. DAL- Not only did Delta post a Q3 earnings beat in the premarket despite taking a hit due to the recent hurricanes, but the chart is also currently headed for a Golden Cross. With that in mind, we’re going to signal the DAL Weekly $52.50-54 Calls. First up this morning, we’re going to start off the fresh trading week by reviewing the performance of the CarMax options we signaled in Friday’s premarket report on the heels of the company’s Q2 earnings beat. We’re constantly pounding the table on post-earning options trading, simply because we are so very often successful in our selections. Volatility is a swing trader’s best friend, and few things create it more quickly and effectively than a solid beat on earnings. We just updated our readers on our coverage of HMNY last Wednesday, when we pointed out that we slated the stock for tracking on August 15th and observed a subsequent low of 2.42. By midweek the stock had already made a considerable move up, but Friday’s session brought another big pop to new highs. HMNY traded in a daily range from 5.67 to 7.95 gaining 40%, a very respectable intraday move in and of itself. The new high marked an overall move of 229% from our observed low. Volume was much higher than average all last week, and the stock maintain roughly half of its daily advance into a fairly strong close, so we’ll need to keep monitoring HMNY for the continued establishment of higher highs and higher lows.